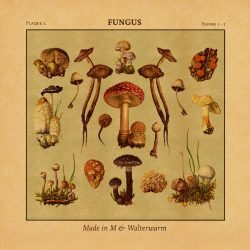 Made in M (Berlin) and Walterwarm (Los Angeles), two of the most recognized lofi beatmakers, link up together in Fungus, an LP with 26 instrumental cuts full of harsh beats and a psychedelic dash. Fungus is more than a beat compilation. It creates a synesthetic sound of blended shades with fungi as the central theme on the interludes and instrumental tracks. The aesthetics in sound is also present in the packaging. Fungus is on sale both on vinyl and tape, with a neat design signed by Jorge Poveda. The dedication of Made in M and Walterwarm have been longstanding. The first one, living in Berlin, has an inherent touch related with the German capital. The second, from California, taps on the influence of several vintage elements which he transfers to his songs.